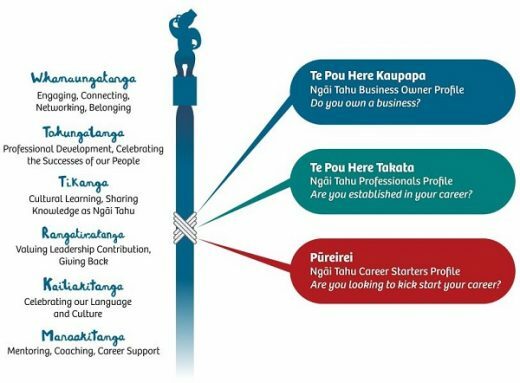 Te Rūnanga o Ngāi Tahu is proud to announce the launch of Te Pou Here – an exciting new tool to grow iwi capability and lift the horizon of opportunity for whānau members – wherever you are in the world. Te Pou Here refers to the mooring post and stems from “te pou here takata, te pou here tikaka” – the post that ties the people and customs together. It is a central online platform where whānau members can connect and develop – whether you’re an employer, an employee, or looking for employment. A mooring post is a permanent structure which travelling vessels can secure themselves to. By attaching yourself to Te Pou Here, you can connect with other whānau members who are also linked to the same mooring. There are three strands to Te Pou Here. Te Pou Here Kaupapa aims to connect our businesses. Are you a Ngāi Tahu member running your own business – big or small? We want to know more about you so we can promote and connect you with other Ngāi Tahu business owners and whānau members. Together we can help you take the next step in the business world. Te Pou Here Takata aims to connect individuals. We want to know more about your skills, talents, experiences, and especially what opportunities and areas you’re interested in as an iwi member. Pūreirei aims to provide whānau members with all the tools and support they need to enter the workforce – whether it’s for the first time or whether you’re returning to the workforce after some time away. Here you’ll find the assistance you need to take each step on the journey to employment. To make the most of this opportunity, register today at Ngaitahu.iwi.nz/tepouhere. Tell us who you are, what you’re interested in, what you want to develop, and let us know how we can help you. Through Te Pou Here we can make the most of whanaungatanga – our relationships and what binds us together as Ngāi Tahu people.